The high tech design of cavity and fan combination enable to raise temperature evenly, both horizontaly and verticaly.Due to this uniform energy distribution the prefect and same color of cooking can be seen at top & bottom. Stainless steel cavity enables better reflection and uniformity of heating inside the cavity to better even cooking. This cavity does not peel off like in coated cavities where in the continuous rubbing of the turntable deteriorates and eventually peels off the coating exposing the base material. When You have so much in your head, memorizing auto-cook menu numbers can be a chore. Leave it to the simple and easy to use "One Touch Express Menu". 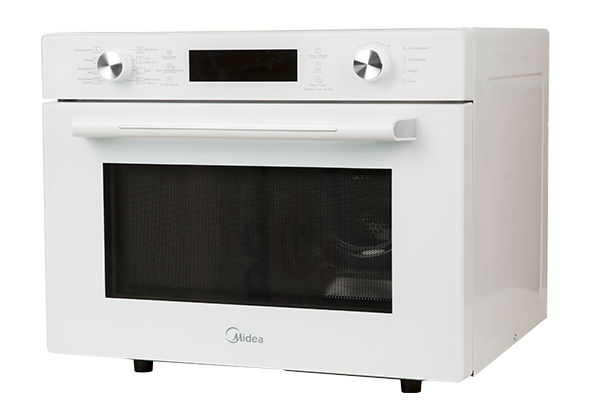 All you have to do is press the button from preset options and leave it to the Midea Microwave Oven.After this just put in the ingredients and your favrite dish is ready with in a few minutes.